A very long time ago I bought this pattern for a 'Market bag'. 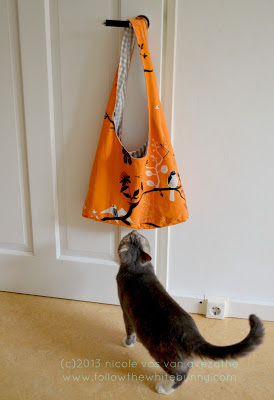 I thought it would be a perfect bag to take with me to the Fat Quarterly Retreat next month so I decided to grab some (IKEA) fabric from my stash and try the pattern. I'm glad I didn't use some fancy Echino fabric (like this one for example) on my first try because the finishing on the inside is not uhm... perfect. Officially it's a reversible bag but I'm happy with just showing the happy orange side to the general public. ;) It's not a complicated bag at all, I just had some trouble understanding the directions. In the pattern an interfacing was used which I left that out as the outer fabric was a sturdy, canvas-like material. I also left out the pockets. All in all I"m quite pleased with the overall look and I'm sure I will make another market bag soon one day. I took my newly made bag with me to an informal meeting of Dutch Modern Quilting group 'Double Dutch' in Leiden yesterday. There were 7 ladies and there was lots of chatting, a bit of show and tell, eating cakes and (in my case) very little sewing. There was an ugly fabric swap too, except the fabrics weren't ugly at all. Look at my loot! The really ugly fabrics were in the small 'Scrap Vomit' starter packs I handed out to the other ladies. ;) I also showed my Scrap Vomit Quilt top to give an idea of how lovely 'ugly' fabrics can be. 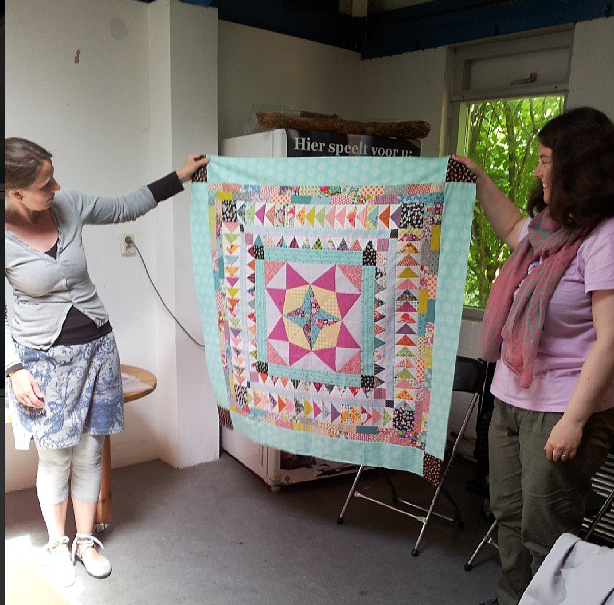 There were more accomplished quilting efforts on show too, like this beautiful quilt made by Muriel. And Linda managed to finish a fabulous pillow (it was already half finished, but still), which gave me serious pillow-envy. Linda has an Etsy shop too, full of beautifully stylish hand made zipper pouches, pincushions and more. Thank you ladies of 'Double Dutch' for making me feel welcome in your group! Hi! We had fun, didn't we! I also got some ugly fabric that isn't ugly at all. Thank you! 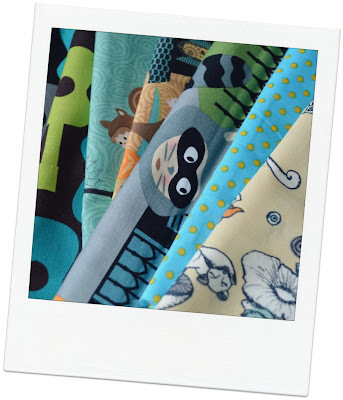 Another tip: we cut some of the left over 'uglies' to 2.5" inches for the scrap vomit quilt!